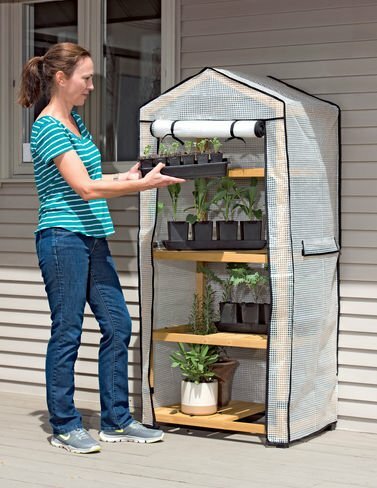 Standing more than 5' tall, this greenhouse protects loads of seedlings and houseplants from chills and wind. There are four shelves, each with adjustable slats. Spread the slats evenly across the shelf, or slide them all to one side to accommodate taller plants on the shelf below. Polyethylene cover with zippered roll-up door for easy access and ventilation on warm days.